Edward Alexander has worked as a park ranger and historian at Richmond National Battlefield Park and Pamplin Historical Park. He has been a contributing member of Emerging Civil War since 2013, serving as lead editor and cartographer of the Emerging Civil War Digital Shorts and author of the book Dawn of Victory: Breakthrough at Petersburg. 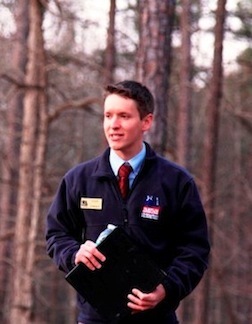 Edward also volunteers as Tourism Committee Chairman for the Petersburg Battlefields Foundation. He currently resides in Richmond, Virginia. Dawn of Victory: Breakthrough at Petersburg, March 25-April 2, 1865. Savas Beatie, 2015. “Life of the Civil War Soldier in Battle.” Hallowed Ground. Winter 2013. Edward, will you be doing another last ride with AP Hill in the future. I am 47 years old, and live in North Carolina, and have done a ton of independent research on the civil war, and especially AP Hill, for many years. I have been to the spot where he was killed, and have also been to Pamplin Park a couple times over the years. I was a history major in college many years ago, and have always loved studying the civil war. By the way, I live only 15 minutes form Bentonville Battleground. If you ever do that last ride of AP Hill again, I would absolutely love to be there and learn more about my favorite General. Please let me know. I just viewed your August 6, 2016 C-SPAN-3 lecture, regarding the battle at Petersburg. Ho delightful! The minute of detail, along with the historical “facts” of the battle were revelatory and amazing, for both the “accidental” and strategic ending. I would certainly enjoy further exchanges; as a resident of the Land of Lincoln, with an especial interest in Grant. Nevertheless, how enjoyable was your lecture, how masterfully you presented! Exceptional presentation on the breakthrough. Just watched it and thoroughly enjoyed it and the rest of the speakers at the symposium. This reminded me that I was at Pamplin about a year ago and bought Edward’s book and was fortunate enough to share a friendly conversation with him and get him to autograph my copy. I really enjoyed the computer graphics displaying troop movements at various times and places. Is software like this available anywhere on various battles?